At Custom Fitness we have it all, and for every level. We offer a 24-hour full access facility with state of the art fitness equipment. We have group fitness classes such as Spinning, Boxing, Yoga, Bootcamp, Body Sculpt or Body Rip to energize you and tone your body, or individualized or group personal training for weight loss, maintaining, or sport performance. WE GIVE YOU EXERCISE WITH OPTIONS! We have created a customized gym around you and your schedule. Our 24-hour full access facility squeaky-clean & up-to-date with fun and inviting spaces to do your thing. Choose the membership that’s right for you. Personal Training is the fastest way to reach your fitness goals. Our certified personal trainers provide guidance and inspiration with customized programs. Whether you want to lose weight and keep it off, build lean muscle, or just look and feel better in the clothes you’re in, your Personal Trainer will take the guesswork out of how to get there. 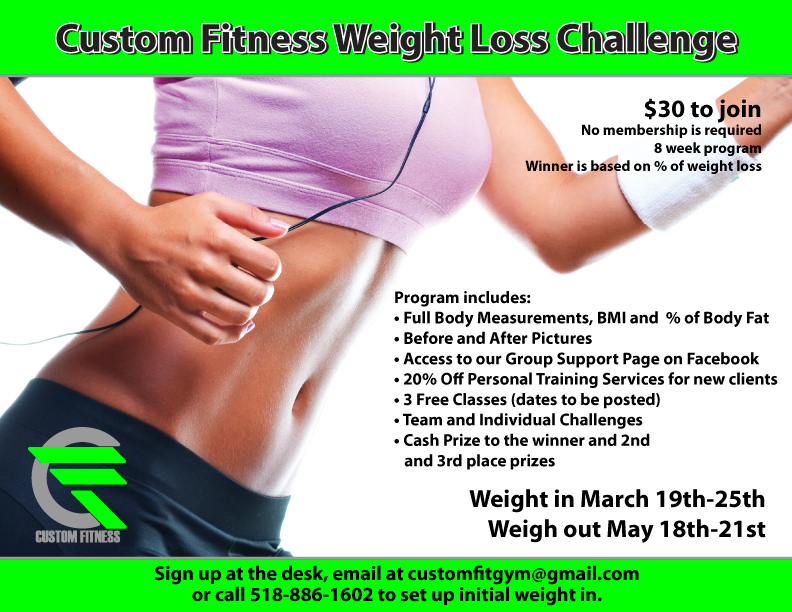 Custom Fitness offers personal training options to fit anyone’s goals, time availability, and budget! WE OFFER A VARIETY OF GROUP CLASSES FOR EVERY LEVEL - Spinning, Boxing, Bootcamp, Body Rip, Yoga, and more! WHETHER YOU ARE A BEGINNER OR ADVANCED, we have the perfect class for you. Our experienced and fun driven instructors are the best around and we offer classes every day throughout the day. Check out our easy online reservation system.